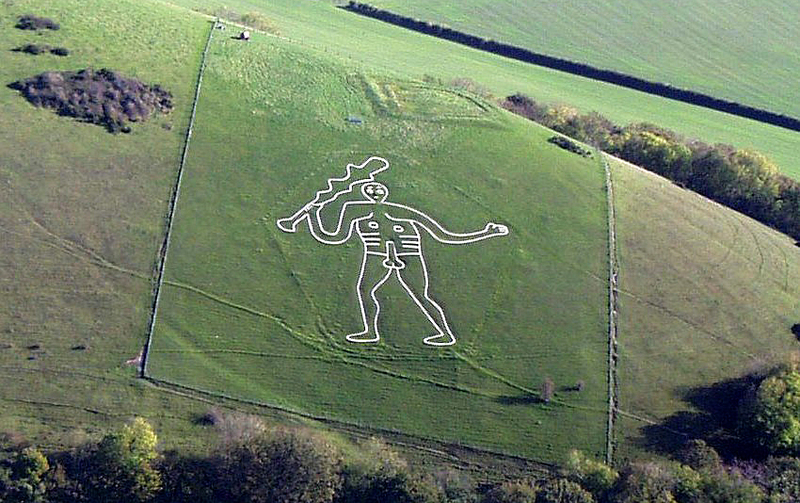 The Cerne Abbas Giant is a hill figure in Dorset, southern England, cut out of the turf and filled with chalk to make the image. It is a large male figure, 180 ft. high (55 metres) and 167 ft. wide (51 metres) with an erection, and wielding a club in his right hand, suggesting aggressive fertility! Its origin and age are unclear as the earliest mention of its existence was not until the late 17th century, yet regardless of dating it has become an important part of local culture and folklore. There are suggested links back to Hercules which were compounded in 2008 when it was discovered that there may at one time have been a cloak over his left arm, mirroring a similar ancient image of the Greek god. At the top of the hill on which this figure appears, Giant Hill or Tredle Hill, is an earthwork known as The Tredle or Frying Pan. In 1993 the Giant was given a new nose by the National Trust and renovation work is carried out quite frequently. The image has often appeared in contemporary culture on television and in adverts and it is said postcards of the image are the only indecent photographs that can be sent through the Royal Mail. Location: On the A352 between Dorchester and Sherborne, DT2 7AL. Please note: Postcodes can be approximate in rural locations.